New book, some shelf wear to cover. 128 pages. This survey examines the contemporary issues of Henry, and his reign, and assess the successful portrayal of the king as the larger-than-life, ebullient character that every British schoolchild still recognises today. It also offers fresh insights into the depictions of Henry's reign in a variety of media over succeeding centuries - in plays, painting, prints, and more recently, in movies and TV. 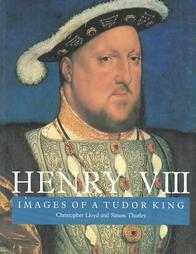 The book is illustrated with a host of wonderfully rich paintings and artefacts which complement the text to offer a splendid, varied and unique view of the person and reign of Henry VIII.